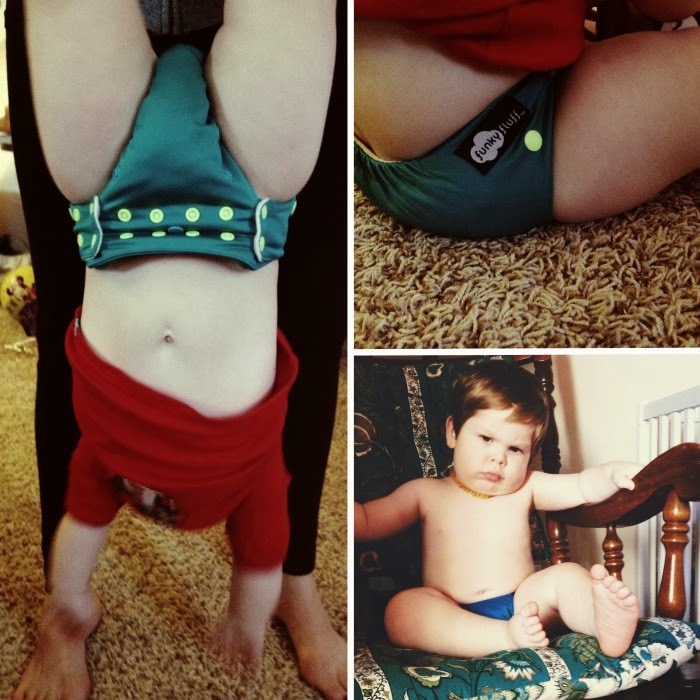 This sponsored post is a collaboration between Funky Fluff, The Pierogie Mama and That Mama Gretchen, We are thrilled to share our cloth diaper love because we're truly floored by these exceptional diapers. Enjoy, and don't miss the amazing giveaway! There's something new in the cloth diaper world, friends ... I've raved about Funky Fluff before and today I'm thrilled to share about their new release ... the Funky Fluff Fusion Bamboo 3-in-1 System 2.0! Best of all The Pierogie Mama and I have teamed up for this grand debut and it includes a super thorough review (we've seriously tested every dimension of this diaper) and a big, no, ginormous giveaway! First off, we want to share a bit of the heart behind Funky Fluff, because companies with a purpose and passion speak volumes to us. 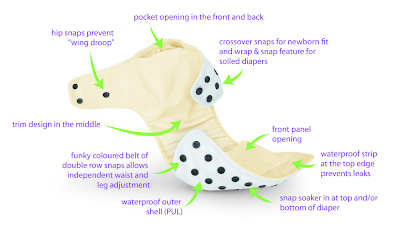 Funky Fluff was founded by Kathy and Tricia, long time friends with a passion for cloth diapering. They "live, breathe and LOVE cloth diapering" and it's their goal to help other mamas be successful in cloth diapering their children. Together, Kathy and Tricia have cloth diapered 4 boys and have grown their home based, Canadian business through tons of hard work. And their commitment to quality products obviously hasn't stopped since they're debuting a 2.0 version of their popular bamboo cloth diaper. Ready to relish in all the features of the 2.0? Now, a little introduction before our official reviews ... between us both we've tried almost 30 different brands of cloth diapers between our 3.5 children (Gretchen's daughter and son and Bianca's daughter and sweet bump due in March). So, when we say we like a certain feature or really trust something about a diaper, we're not joking. We've got A LOT of comparison power. That's probably why we're so excited to share Funky Fluff's 2.0 with you! I've got a pretty trim little miss - at 21 months old, she just tipped the scale at 23 lbs and is about 31 1/2 inches tall. She's a perfectly proportioned little doll, and her smallish stature has been both a blessing and a difficulty. I love how long clothes last for this girl - she's still wearing 12 month zippies! But fitting diapers around her waist in proportion to her height has become a difficulty with her night time diaper, as she still wets a lot at night and you've got to find that right balance of fluff and stuff to make sure you can make it through the night. I've been loving the Funky Fluff Bamboo line (both the 1.0 and 2.0s) because the bamboo liner and inserts are extremely thirsty. Parched. When she started to leak out through her 'tried and true' night time diapers that had been working for us for over 12 months, I tried the Bamboo Fusion 1.0's and was immediately relieved! After stripping and repairing velcro (the next step was re-doing elastic that I really don't think needs it), I was almost ready to try 'sposies. Admittedly I was a little apprehensive when the 2.0 version dropped the double gusset feature (because she's also a side sleeper) but I quickly learned that it wasn't the double gusset that was saving my biscuits in the middle of the night - it was that awesome bamboo material! Zero leaks and no changes through out the night = a well rested Penny and this preggy mama. Our night time diaper solution is a Funky Fluff Bamboo Fusion 2.0 stuffed with one heavy duty bamboo soaker or a light bamboo soaker with booster. And while I have your ear can I tell you how much I love the soakers? They are SO dense yet thin - they are by far my favorite stuffer for diapers because they hold so much liquid. Before Max was born, I thought I knew almost everything about cloth diapers. I mean, I'd cloth diapered Jemma for 34 months and gone through many successes and failures as we narrowed down what worked best for us. Then I had a son and I began the learning curve all over again! Max is almost 17 months and is about to tip the scales at 32 pounds. Pretty much the opposite of Bianca's petite Penny. If I've learned anything about diapering both a son and daughter, I've learned that they pee different (obviously) and this therefore, requires different features to adequately do their job. Funky Fluff covers the gamut thanks to their bamboo lining and inserts in their 3-in-1 system. It's definitely hard to find cloth diapers that do their job for chubbier babies. I need a high rise to prevent top leaks and large enough leg elastic that hold without leaving marks. Right now Max wears his Funky Fluff on the widest waist setting. But I'm not worried about outgrowing our Fluff since he's really starting to run and will most likely gain more height and less weight in the coming year. I won't speak too much to the thirst of the bamboo - Bianca sang that praise - but I will say that we too ALWAYS opt for an extra stuffed Funky Fluff 2.0 for naps and long car rides. I will add that there is nothing softer than a bamboo diaper. 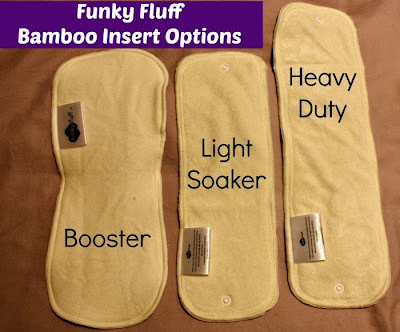 So, between the amazing absorbency and the gentle fabric, I pretty much want our whole stash of diapers to be filled with Funky Fluff's bamboo 2.0 diapers. 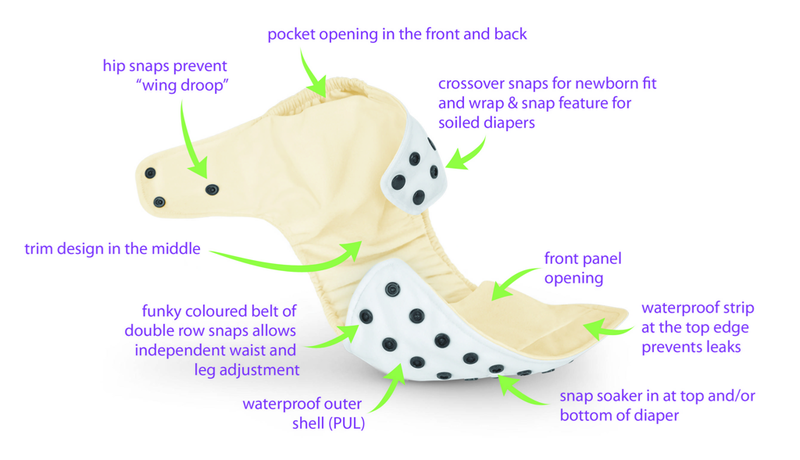 My only hope and recommendation for Funky Fluff is that they'll launch a trainer/pull-up cloth diaper design by the time we're ready for that transition. I would LOVE to see a pull-up design with bamboo inside and PUL outside ... maybe even a bamboo padded underwear. Wouldn't that be awesome? Ready to add some Funky Fluff to your cloth diaper stash? 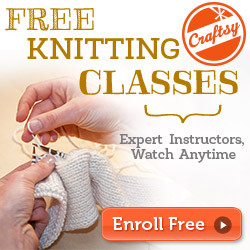 We couldn't encourage you more - you won't be disappointed! You can purchase the Fusion Bamboo 3-in-1 System 2.0 here, or consider saving with the purchase of a bundle. Still on the fence? Maybe consider a Starter Kit so you can compare the bamboo and stay dry options while testing out the reinforcing soakers and boosters. 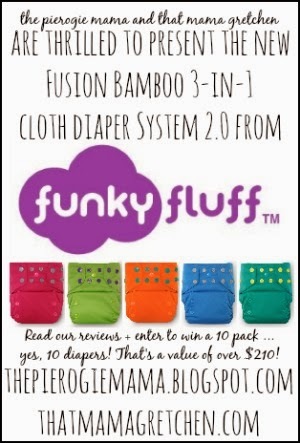 And now, what you've all been holding your breath for ... the amazing giveaway to celebrate the launch of the 2.0 version of the Funky Fluff Fusion Bamboo 3-in-1 System! Funky Fluff is giving away a 10 pack of the 2.0 in your choice of boy, girl or gender neutral colors. Ohmygoodness, amazing, right? Enter below and share within your social media circles with #funky10pack ... we can't wait to announce a winner! What a wonderfully fluffy new year one lucky mama and baby will have! 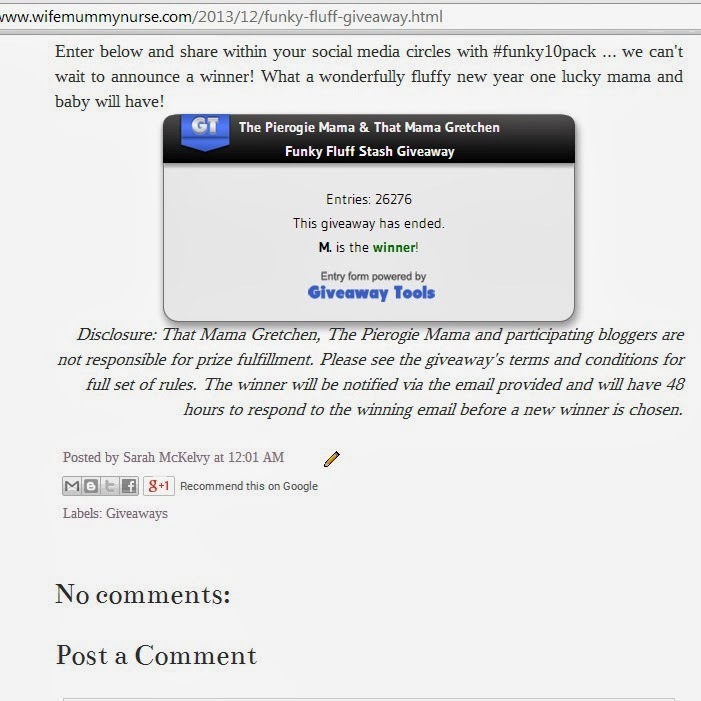 Disclosure: That Mama Gretchen, The Pierogie Mama and participating bloggers are not responsible for prize fulfillment. Please see the giveaway's terms and conditions for full set of rules. The winner will be notified via the email provided and will have 48 hours to respond to the winning email before a new winner is chosen.